Before we get into tiling a bathroom, let me vent a little because I’m really peeved at the owner of the tile shop we hired to tile the tub surround and floor. A bunch of careless mistakes were made, plus he gave us incorrect instructions for prepping the space. I’ll flesh out all of the problems another day because there are definitely lessons to be learned from my experience. Right now I’m too crabby because when I washed out the tub and started to wash off the hazing from the tile, I noticed the worst thing: not only did the he gouge our brand new, perfect acrylic tub, he shoved some grout in there to hide the damage and didn’t utter a peep about the damage to us. Can you believe the dishonesty?!? This really bugs me because this tub was not easy to acquire. After getting two damaged tubs delivered, we finally drove 3 hours to Duluth, MN to pick up a tub in person and drove it the 3 hours home. When we got it home, we saw its flange was busted so the next day we drove back to the States for another 6 hour round trip and got a new tub – but not before we spent an hour inspecting every inch of it with four anxious salespeople. We inspected it again when we got it home, and once again when we installed it because we wanted to be certain it was absolutely perfect. Mid-way through the tiling, I cleaned the drop cloths and cardboard I had provided for the tilers to cover the tub (they showed up with nothing so I had to scramble to find them something). I also cleaned out the tub, worried they’d grind in chunks of mortar with their boots, and inspected it again then – still no damage. Whew. In the final two days of the project, the owner showed up to finish up the job and that’s when the damage happened. Instead of fessing up, he and/or his employee tried to hide the damage and then they scooted out of here like their pants were on fire. Not sure what I’m going to do (and he’s certainly not returning my calls). While I sort it out, here’s a look at what’s involved for tiling a bathroom and what my tile choices look like installed. 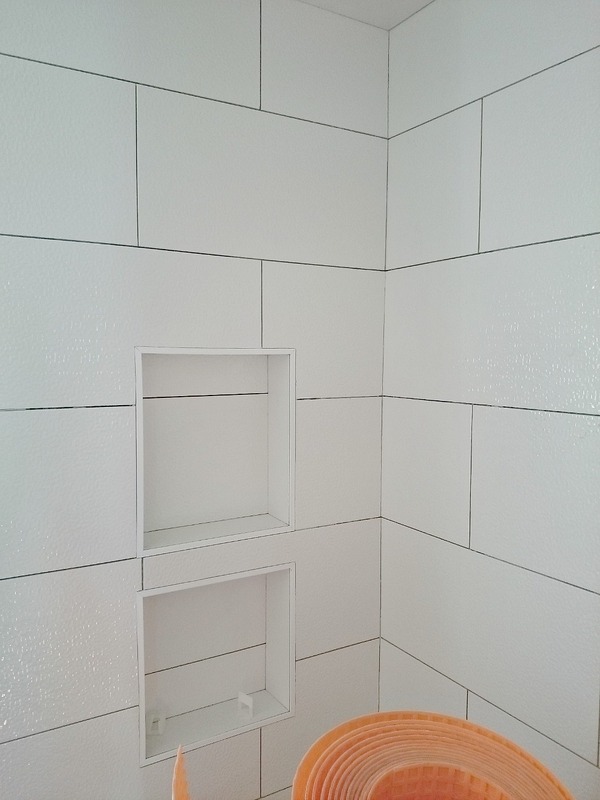 Day One: Prep, Some Tiling & I LOVE the New Shower Cubby! 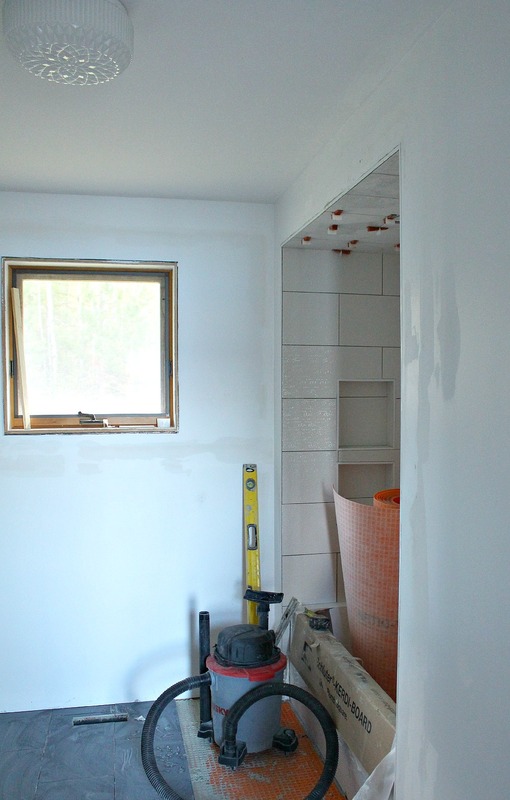 After day one, about half of the tub surround was tiled – the prep work had eaten up much of the day. 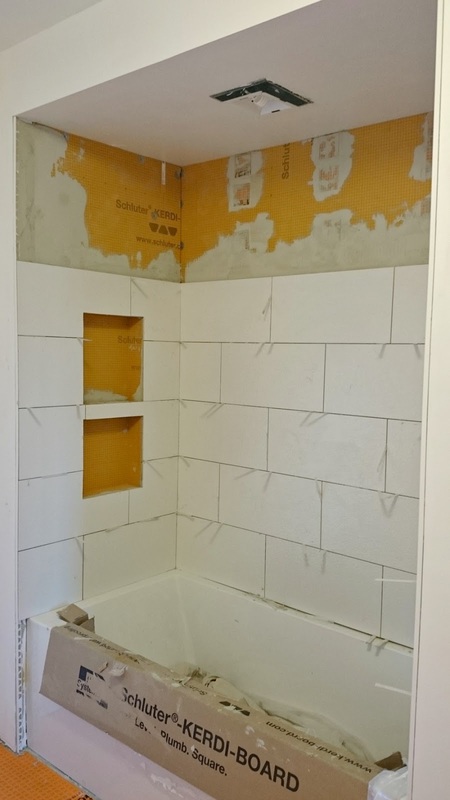 Tiling a bathroom is not a quick job! 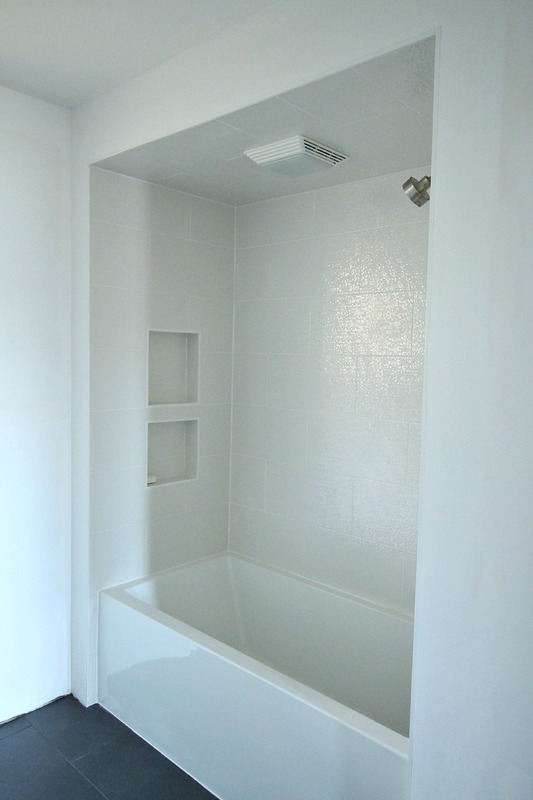 I’m thrilled about the shower cubby – we definitely longed for a cubby in the townhouse. 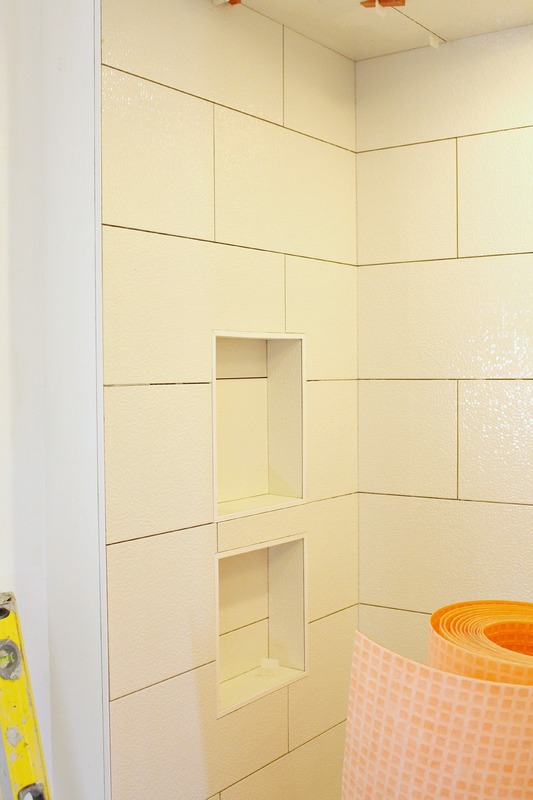 We chose the Schluter KERDI-BOARD shower niche with shelf and I highly recommend it because it offers great storage and the Schluter products are top notch for being fully waterproof. Day Two Involved a Trip to the ER! 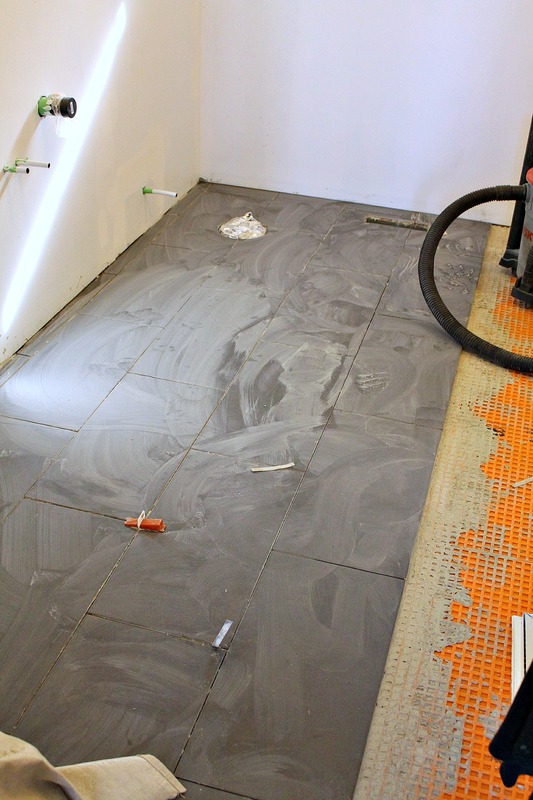 Day two was a stressful day and probably not the norm for what to expect tiling a bathroom! One of the tilers sliced into his arm with a chop saw and because he was working here alone, I grabbed a towel to put pressure on the cut and quickly drove him and his truck to the hospital (which is about an hour away). I was worried that he might feel faint or pass out on the road. Then I was stuck in town, so my Dad drove me home and had to turn around and drive the hour back into town. He was not happy. The next day, the tiler showed up to try to finish the job on day three. Seriously – even with a big gash! I was thankful he came back to work because he is a fabulous tile setter. He was so careful about the tile placement and making sure that the pattern looked good. He worked tirelessly to avoid any tiny, unsightly strips of tile and he double checked every decision with me – he’s the one who even thought to cover the tub! Unfortunately, his last day with the company fell on day three of the job, so he couldn’t finish the work. If I’m being honest, early on in the installation I had some doubts about my tile choice for the tub surround. It was reading really beige and dull, especially when the naked florescent bulb in the shower was turned on, or the light was really dim. As hoped, the tile has an organic quality, with a nod to mid-century modern mosaic tile – which is what drew me to it. I still ogle turquoise tile, but this is subtle enough that down the road I could update and refresh this space easily with some accessories and artwork. 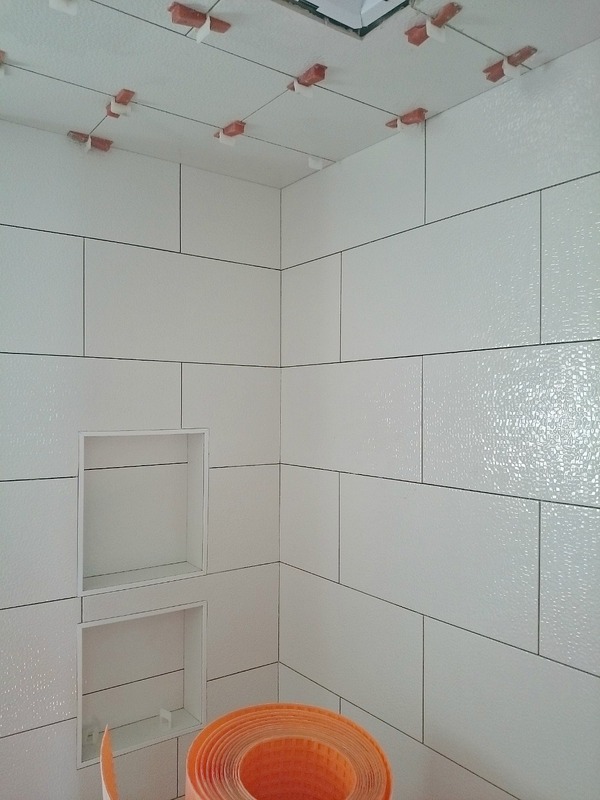 Plus – so little grout!! 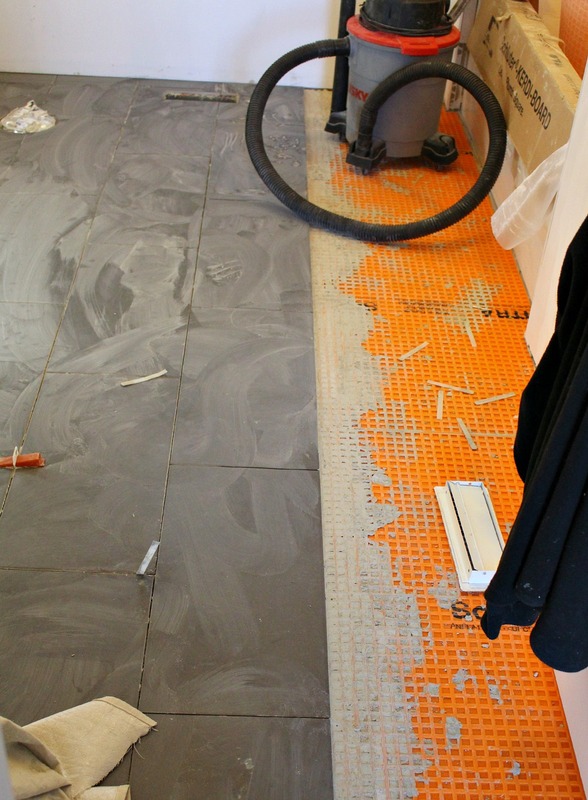 Even the tilers admitted that the fewer grout lines the better. 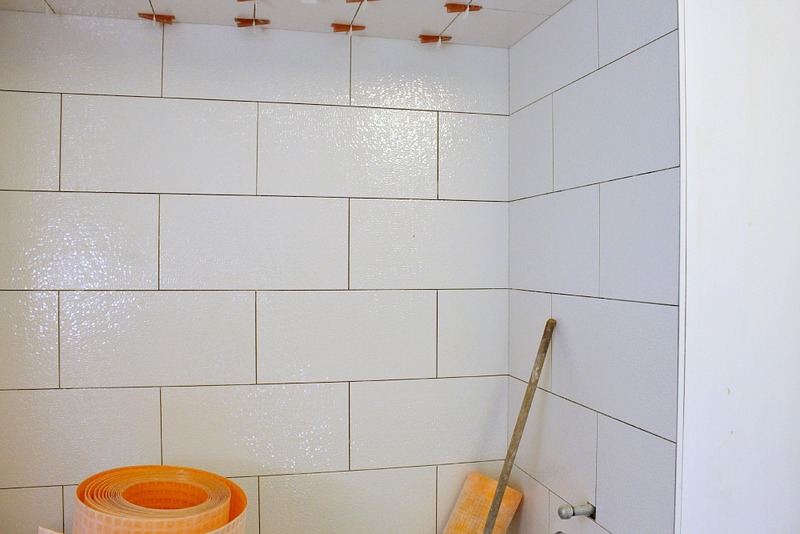 We might be in this house for the long haul (which is why the damaged bathtub bothers me so much), so I wanted the most expensive elements to be neutral – but not boring – and we didn’t want to have to be tiling a bathroom again, anytime soon! I think this tile fits the bill. Days four and five (both half days) of tiling the bathroom consisted of the owner and one employee replacing a flawed tile I pointed out (but not the chipped one I also requested be replaced), finishing up tiling the last few rows of floor tile, and then caulking/grouting everything. That’s when the damage to the tub happened. But let’s not belabor that and let’s enjoy the tile instead! 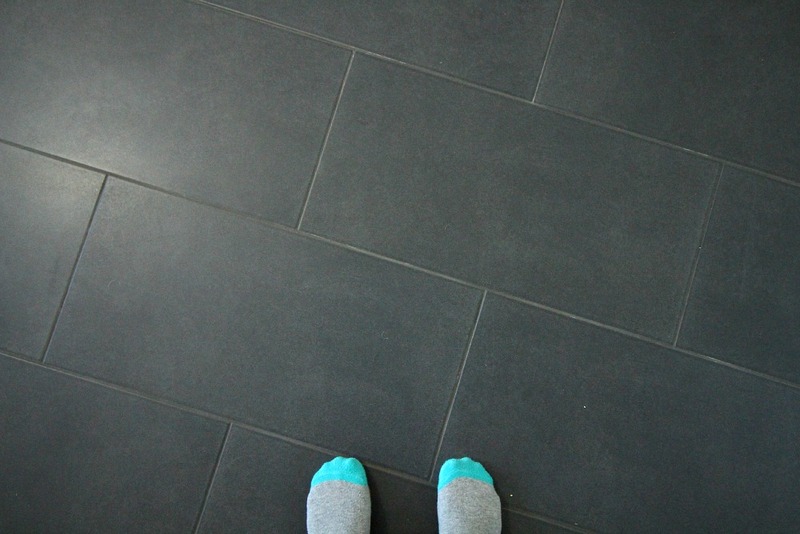 The floor is very simple and I’m so happy that I went with a matching charcoal grey grout because it just makes it look so modern. There are a few small chips on the floor tile too (argh!) and it’s still looking a little washed out and dull because it needs a few more washes before all of the hazing is removed. I’m hoping the grout just has some dust in it because right now it looks a little uneven. Le sigh. 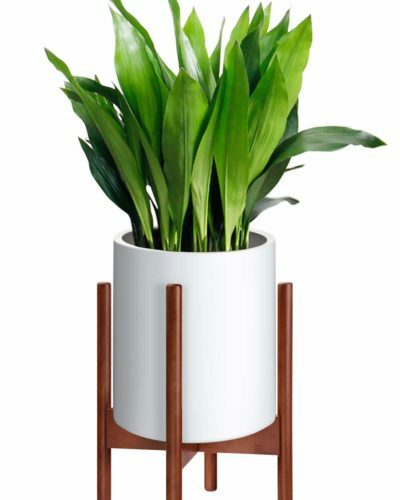 But I love the size and colour – it ties in nicely with the fireplace and it will look amazing with the walnut cabinetry. I should be feeling excited about how everything is coming together, but I’m disappointed that my tub got damaged in the process – especially given what a nightmare it was to get a non-damaged tub. On the bright side, Hubs and I bathed inside the house for the first time in a long time and it felt amazing. 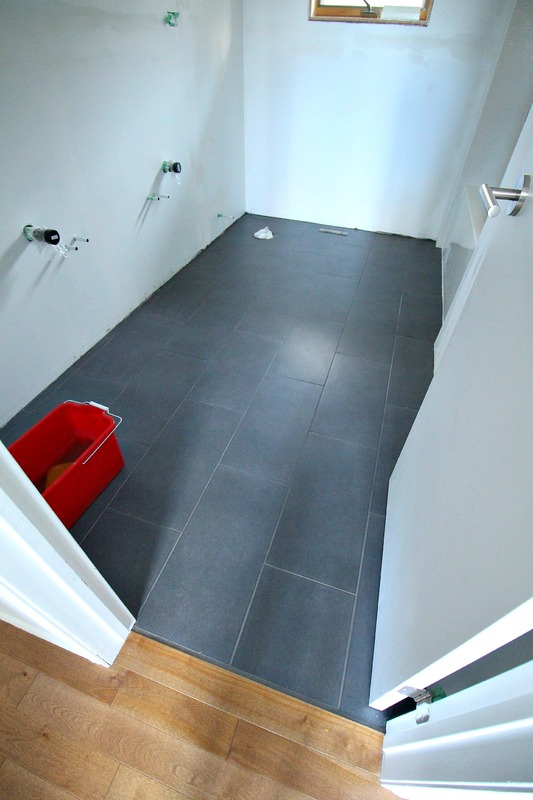 Plus I like my tile choices and now that tiling the bathroom is done, we can move forward with the bathroom renovation. 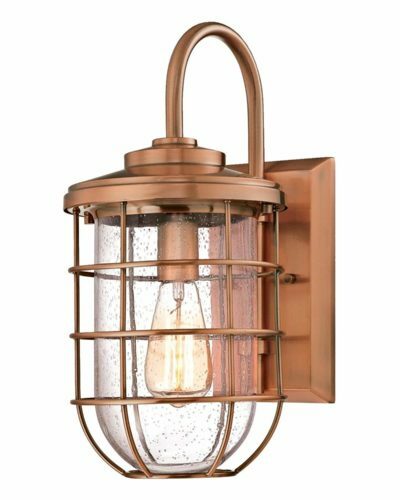 Our Kohler fixtures arrived and they are too gorgeous for words…details soon! Dark Grey Metal Siding | Siding That Sparkles! Oh my gosh – I feel for you! How frustrating – and so unprofessional the way they dealt with the damage, ie. not saying anything. Good luck with sorting this all out! I am so sorry to hear that the tub was gouged, after all the trouble it took to source it. Please don't back down from the gouger, he is responsible. The tile looks amazing. Great choices. Looks like it was worth all of the effort and heartache. Thanks! I'm happy the tile choices look good 🙂 I am definitely not backing down from the gouger. 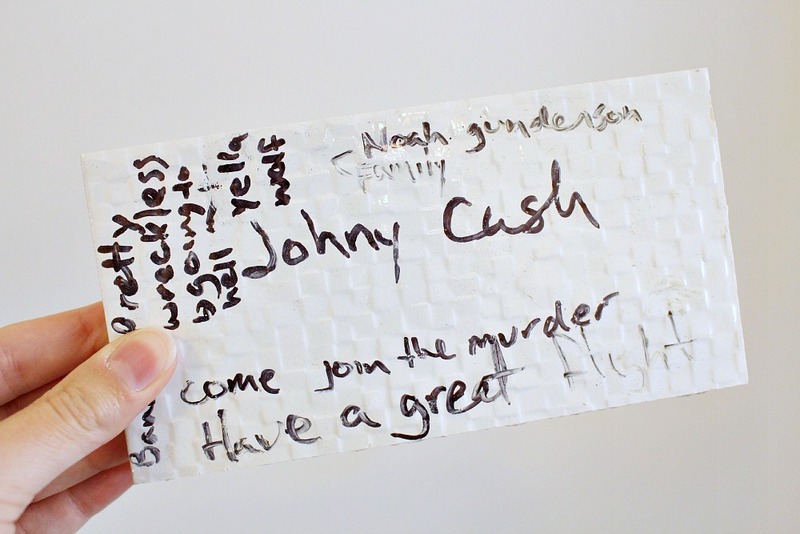 He's getting a visit and letter from me today – so not how I want to spend my day. The bathroom is looking gorgeous and I love all the choices you've made! The damage the tile shop caused and their subsequent behavior is so upsetting though. Is there a Canadian version of the Better Business Bureau you can complain to? Have you already paid them in full? What about small claims court… ? Whatever you do, try to keep up your motivation for the rest of the reno – we're rooting for you! Thanks! It was exciting to see it come together, but this really took the wind out of my sails. I have not paid them in full and will definitely be pursuing court action and a report to the BBB if they do not remedy this situation promptly. I'll keep everyone posted! Looks good, sorry to hear about all your troubles, but, and I mean, but, you should see my shower — terrible job. 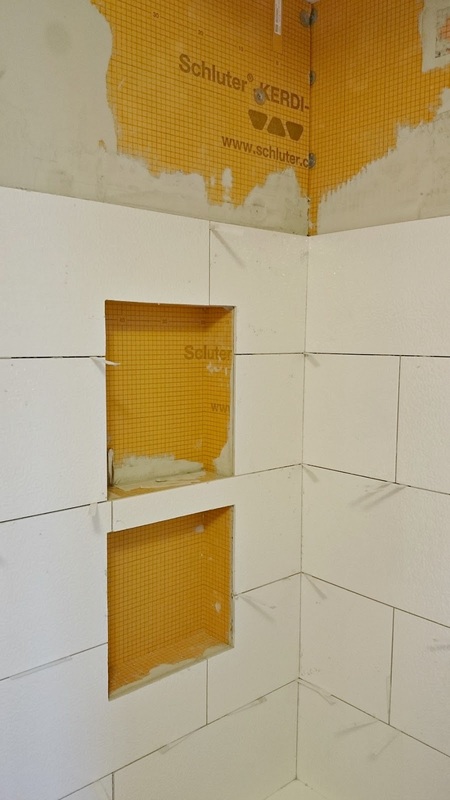 they were supposed to do 1/8″ grout lines but did 1/4″, SAYING THEY had to because of uneven wall? Then our deco surround, mosaic tiles had broken and chipped tiles — they said, they come that way. Also installed over a shlutter system, like yours, and now i find some of the mosaic floor tiles are loose, they are springy and the grout will not stay in place. when does it ever end? oh, yeah, and this was a 15 day contract now going on 30 plus days. These guys claim they have installed 1000s of showers … i don’t know where they got the pictures to show me but it couldn’t have been theirs. Oh my goodness, that really does sound terrible! It’s so disappointing to pick out finishes and hire a pro – only to see such terrible results. I definitely know things could be worse. It sounds like it’s an ongoing nightmare for you? Hopefully you can get them to fix things? Oh you just want to smack them!! There should be some way to have it repaired so it doesn't look like a repair and they should pay for it. I don't think there is anyone in town who does this kind of work – I found ONE guy but his website is out of date and he hasn't returned my calls. So, might not even be an option! I am crushed for you :(I had a cracked acrylic tub in an old apartment and the management got a company to come seal it up so it wouldn't leak. They used some kind of epoxy or something and polished/sanded it somehow. 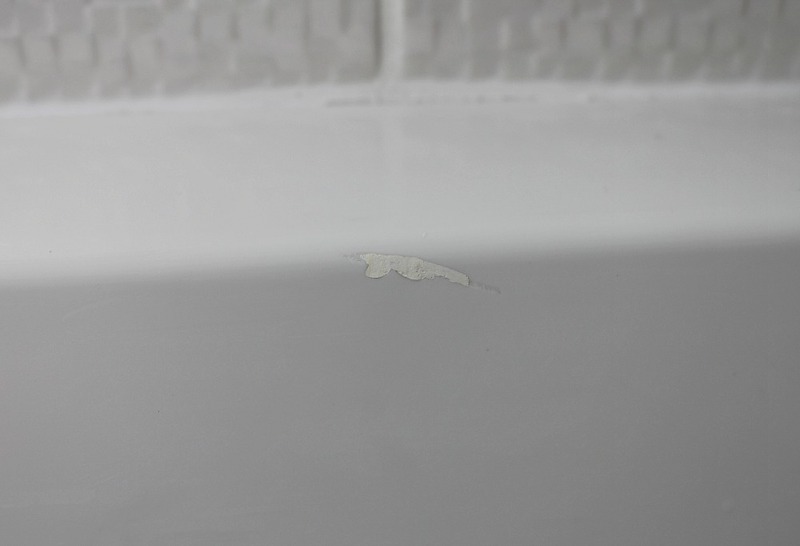 It was a bit rougher than the rest of the tub if you touched it, but it wasn't visible (the crack wasnt in a really noticeable spot) and it functioned perfectly. It didn't bother me at all. But that was in an apartment and the tub was a few years old. Given that this is a brand new renovation and you went through so much to get an undamaged tub, this is just heartbreaking! I hope you can get some satisfaction from the company.I wonder if the tub is somehow brittle or if this truly just a streak of terrible luck. I don't think the tub is brittle because it was really expensive ($1000) and came with excellent reviews. My first two tubs were cast iron from a different brand. So it's definitely my bad luck, not a defect of the tub. The damaged acrylic one was smashed in shipping – or an elephant sat on it, lol, it was pretty bad. The owner's employees worked in this tub for three days without issue. I think he was careless.I have heard that repaired tubs don't feel the same – how could they? – which is such a bummer. I am wishing the whole thing could be ripped out so it can be done right! So sorry about the damage!! We had a problem with our tile guy and I'm still so mad everytime I'm cleaning the shower. So….hope you don't feel that way when it's all said and done but I'm not sure what can really be done. On the other hand, the bathroom looks BEAUTIFUL. Oh no! That's terrible! What did your tiler do, if you don't mind me asking? Did you take any action? oh, so frustrating! You pay someone to do your tiling for you because it's supposed to be LESS trouble than doing it yourself, not more! I'm sorry. I KNOW! If we had done the work ourselves, I could have splurged on the pricey Fireclay tile and still came out ahead. I regret hiring these folks, for sure. The bathroom tiles look perfect! Really love them. I too wanted beige white tiles for the kitchen reno but the shop had run out of them and got the bluish-purple ones but I love them. Of course my very good handyman aka tiler made some mistakes too and now that the lights over the counter are on you can see the grout not well set but what can one do after the tiler has gone and with all the money paid?AriadnefromGreece! Oh, that's such a bummer! How disappointing. Luckily we noticed this damage before paying the remainder of our bill. I guess it could be worse – he could have taken all our money and disappeared. This is one reason I picked a tiler with an actual storefront. Oh, a former Ottawa townhouse dweller! Hey! !I'm happy to hear your tub was repaired nicely. I went on some home and garden forums and heard a lot of mixed reviews – some repairs look worse and then fall apart in a year. Yikes! I am definitely taking this issue up with him and I'll let everyone know how it goes. Tanya, I'm sorry to hear of your troubles. Like everyone has said, keep harassing until you get the results you deserve. Glad you have lots of before and after pictures. Despite your problems, the bathroom tiles are perfect, the space is lovely. We are in the final stages of a kitchen reno – Cambria Quartz counters were a big splurge for me. I had lived 15 years with Formica. The guy who installed the backsplash did not thoroughly clean up his mess each night and on the weekend when I cleaned properly before moving the contents back into my cabinets I found splotches all over the counters where something had eaten through the top polished layer. Also found numerous scratches. Turns out the guy didn't cover the counters at all during the backsplash install. No resolution to the issue at this point. AAAUGH. I feel your pain. Oh my GOSH – that is worse! That is so, so disappointing. 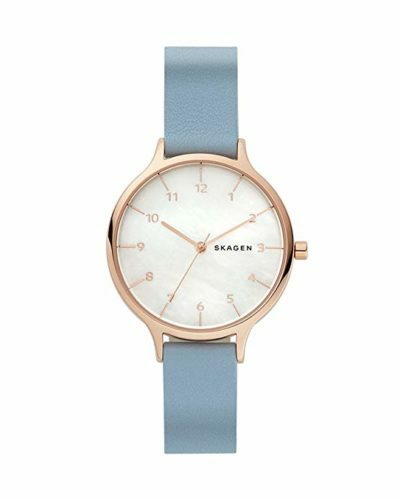 And I feel your pain about finally splurging! 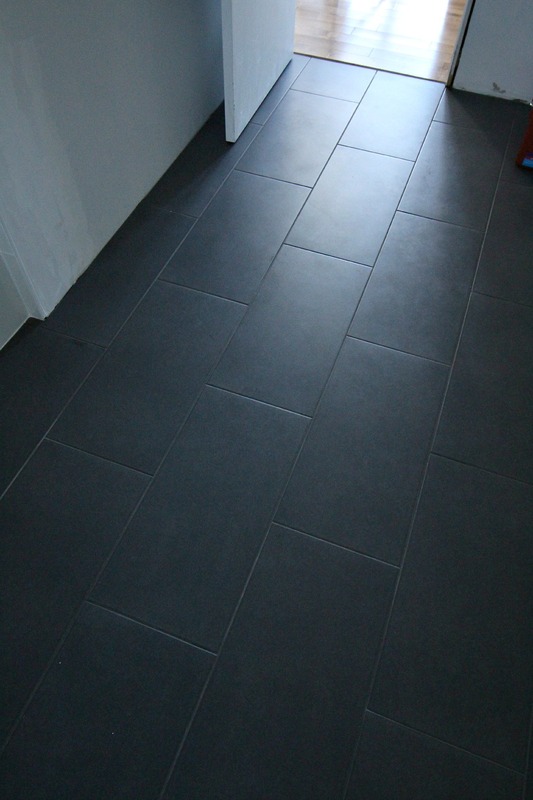 I've always had vinyl floors and cheap, builder's basic tile. I wanted nice finishes and really stretched our budget here – the tub alone was $1000! It's so crummy when you finally treat yourself and invest in your house and someone comes along and wrecks it – no respect. I am hoping you get a favorable resolution. Keep me posted! Quartz counters are very pricey and it's such a shame to have them scratched and damaged right away. Argh, I'm angry for you! I had a gouge much, much worse than that one. We had someone who knows how to fill, fix it, and spot is now totally invisible. That was 12 years ago and it is still invisible/perfect. We found our fix it person through a builder. Gouges happen in new builds. So he knew who THE guy was for fix. So glad to hear you knew someone who could fix it! I have not had any luck finding someone locally. 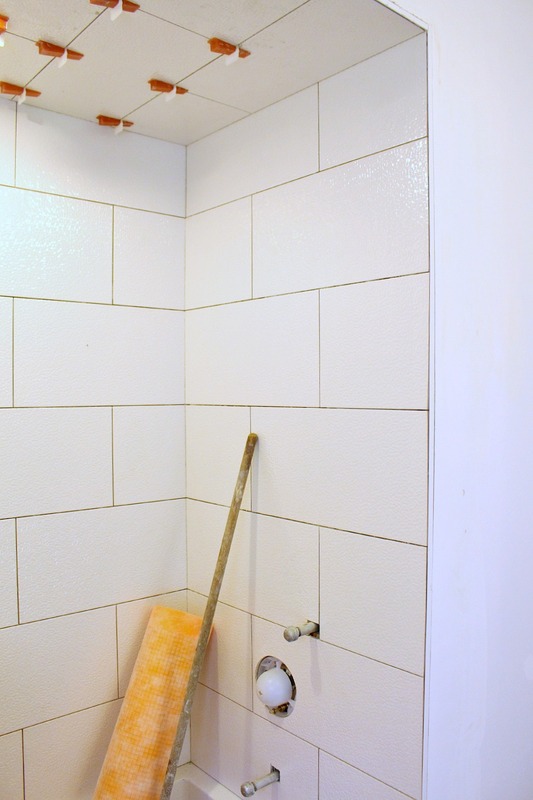 I wonder if that's why this guy shoved some grout in there – he knew repair wasn't an option. I'll keep looking, though – happy to hear yours held up! I've heard some horror stories about repairs, too, so I'm so nervous. I'm so sorry about all the issues you've encountered. The home improvement industry is filled with all sorts,no? But I'm so happy to see these beautiful larger tiles being used in a smaller space. We are considering the same ones, but I was concerned about their relative size in a small bath. I think you've convinced me to go with it. It's beautiful. Happy you like the tile! I am a huge fan of the size and fewer grout lines. You can't always go with this pattern, though. I was told some larger tiles bow a bit and so a triple stack brick pattern in necessary. Talk to your installer about the size of tile and how you'd like it installed before you commit, just to be sure there are no surprises! ARGH! My absolute pet peeve! Since I have been a professional house cleaner for many years, my advice to anyone doing tile and grout above a tub or shower pedestal is to COVER..COVER…AND COVER SOME MORE. 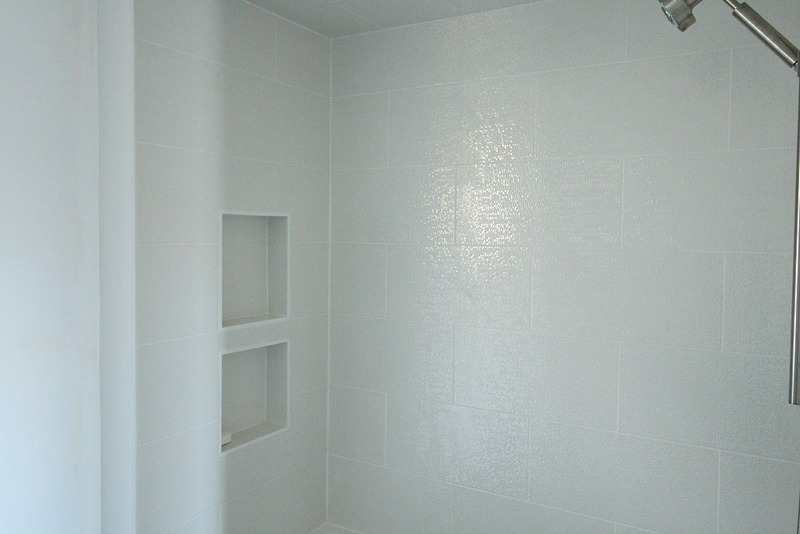 Actually, the chemicals in the grout will etch into a fiberglass type tub or pedestal, and it will NEVER appear clean. I have no idea why the professionals are so lazy about protecting surfaces. Do not back down! Meet with him face to face! I am hoping you haven't already paid him. Believe me, he will want his $$. Now that I am finished ranting, your original vision was a lovely choice. Still looks beautiful! I wish we'd covered it up more. We assumed they would come with drop cloths and whatnot but the owner admitted he forgot them – and he never showed up with any on subsequent days – so I provided some. I wish I'd make some kind of cover or brought a thicker blanket or something – but it ended up squashed on the bottom, anyway. Someone needs to make/invent some kind of perfect tub cover. That is a million dollar idea right there. Arrrggg! that is infuriating. I can't imagine how you must feel. There must be some repair that would fix this- I'm sure this must be a common problem for installers (although prudence and a better tub cover would go a long way); however, though, when you splurge on an expensive tub, compounded by the difficult aquisition, anything less than a mint condition tub is unacceptable. Even once they address this, the tiler shouldn't expect full compensation. All in all, really beautiful so far. What a change! I think if I'd picked a less expensive tub, I might be more amenable to a fix but this tub was pricey – and played hard to get, lol. I think tub repair can be done but I have yet to find that service in this small city. Our only dermatologist left too, so we also lack some essential services. Not surprised I can't find a good tub repairman, haha. I'm making some more calls tomorrow to try to resolve this thing! What a shame! I'm so sorry. When we had our bathroom done, our contractors put a board completely over the tub to protect it. We've since dinged it ourselves (gah! ).I feel your pain. We're trying to finish up a drain tile replacement job that has stretched out 7 weeks, ruined both front and back yards, and had our neighbours threaten to sue us because our contractors put dirt on their property. ugh. you can't really trust anyone to do it right. 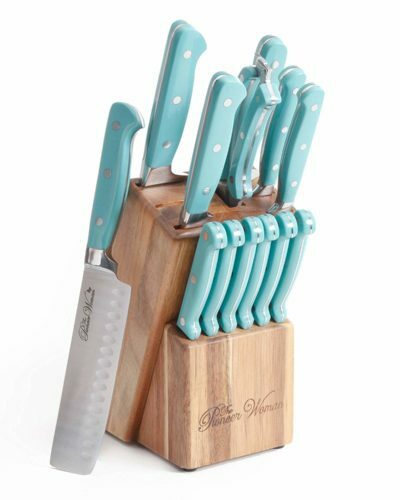 I was surprised when the tilers came with nothing – I had to supply drop cloths but had I known they'd come unprepared, I'd have looked into purchasing some heavy blankets or cutting a board to size. Our tilers in Ottawa were well equipped so I expected that here.Such a bummer you dinged the tub yourself! Oh, that's frustrating too. Can you fix it?I can't believe you neighbors threatened to sue! How stressful. Hopefully your drain tile replacement wraps up soon. Ooooooh I'd be pissed too!! Contractors are the worst, so many bad ones out there. I sure would make sure my cheque didn't clear on their payment until they resolved the issue with my tub. 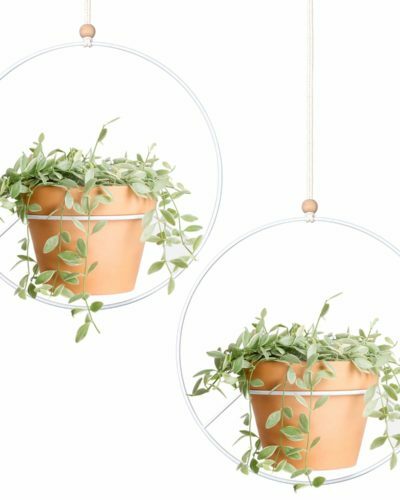 No one wants to live with damaged things especially when they are brand new and expensive! I feel for you. Right, if someone is going to mess something up it better be me or watch out! If it makes you feel any better my tiler (aka husband) cracked our tub installing it, and he just used a cheap DIY kit from Home Depot to fix it & it has held up really well & is only noticeable if you're really looking for the spot! Oh no, he cracked it! Yikes! He must have felt so bad. Happy to hear the kit from Home Depot works. It was an acrylic tub? That is so unethical! What a creep–like you wouldn't notice? I would blast him on FB, if he has a page and report to the BBB. That is all. I am definitely going to the BBB but I'm worried about any discussion on social media because then he could take me to court. I'm going to see what the BBB says and what a lawyer has to say about what I can/can't do. But I am so peeved!! Hard to stay civil. We did a bathroom remodel last year, on the cheap, with several resultant problems. Yes, I cried when our hack finished his work but it was still so very much improved over the bathroom we had there that I was able to finally let it go and enjoy the good things about it (after we had another plumber come and fix the leak into the next room). I don't see how you can remove and replace a tub without causing further damage to the room, so that's out. I don't know Tanya, I'd say withhold money but drop some of your hurt feelings. That is the part you are in charge of. Sounds like your bathroom reno was quite the headache! I'm sorry you had so many problems, but I'm happy you're enjoying things about it now. I'm not hurt about my situation but I am incredibly frustrated because it was a lot of time, effort – and a financial burden – on our part to acquire a perfect tub. Had I known I'd end up with a damaged one, I'd have kept the first damaged cast iron tub I was sent and saved myself hundreds of dollars and months of delays. This is our main bathroom and I've dropped a bundle on high end finishes, which seems like a waste now. I am incredibly angry at the tile shop owner's unethical behavior and I'm justified in feeling this way. I understand what you're saying about being in charge of emotions, but I don't think I should have to put a lid on my anger or frustration. You know, I never thought about protecting other customers! I've been so careful not to mention the company's name because I am fearful of them suing me but you're right – I'd hate for someone else to hire them and end up in the same boat. They've denied the damage, so I am even more concerned about their honesty. They've offered to have it repaired by "their guy" but I am so dubious now about anything they say/offer. I'll be sure to let our Better Business Bureau know what happened, regardless of the outcome. Thanks for reminding me to think of others! I feel so sheepish, but I've definitely been looking out for me alone while dealing with this. Thank you for that link. I have yet to deal with this matter and it looks like I will have to take him to court. It's a good idea for me to start to know my rights. Thanks so much, I appreciate the info! Have you contacted the manufacturer of the tub? They probably have some suggestions for the repair. I will contact them shortly. I went through the company I purchased it from, first, but they haven't returned my call. I will look into how to reach the manufacturer directly – thanks for the tip! I feel your pain. Our electrician and your tile man must be related…… We are in the construction business and my husband is really concerned about the future labor pool. There simply aren’t enough skilled, building-trades people out there. 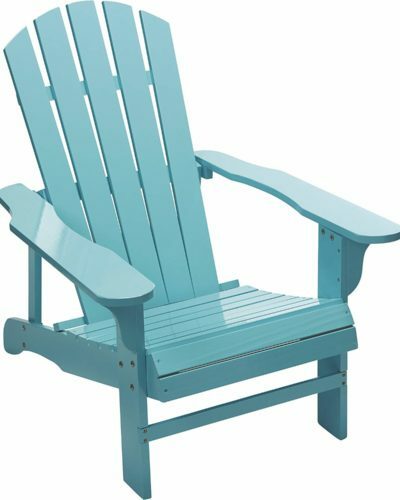 College grads with $50,000 in student loan debt are making minimum wage are Bed Bath and Beyond and he can’t find an electrician willing to work for $75 an hour.Some thoughts – Assuming you could get another tub, is it feasible to remove the first row of tile, install the tub and re-tile? Your leverage is if you owe him the bulk of his money. 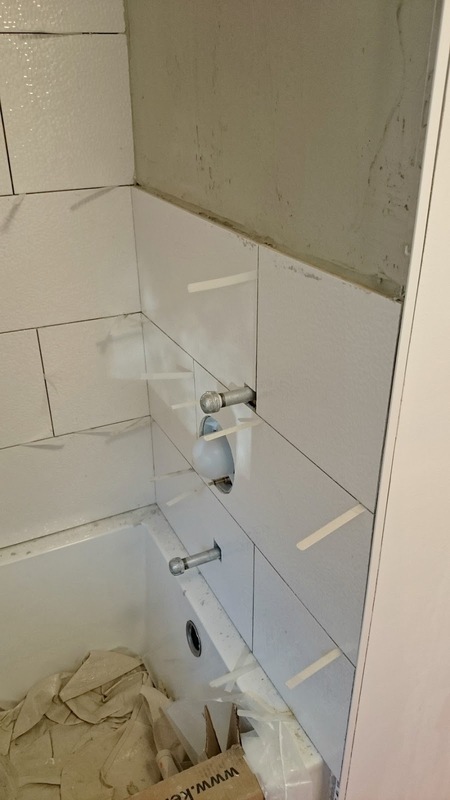 Speaking as a business owner that deals with subcontractors all the time, I would get an estimate for a new tub (installed, not just the) as well as the costs associated with fixing whatever tile would be effected by the installation of a new tub. The estimate will be your bargaining chip.I am in the US so I don’t know Canadian law but here, you would be able to go back on his business insurance to cover the cost of making it right if he can’t or won’t do it himself. Call your home owner’s insurance company and tell them what happened. Friends of ours just went through a similar nightmare (with a pool, not a tub) and they turned a $15,000 claim into their insurance company (and got paid) and now their insurance company will file a claim against the contractor’s insurance. (In America, everyone sues everyone)Is there a licensing board you can contact? We have state licensing boards that govern contractors. Wow – thanks for all this great info! I really appreciate that you took the time to give me some advice. Truthfully, I'm not sure if the tub could be replaced without taking the whole thing apart. 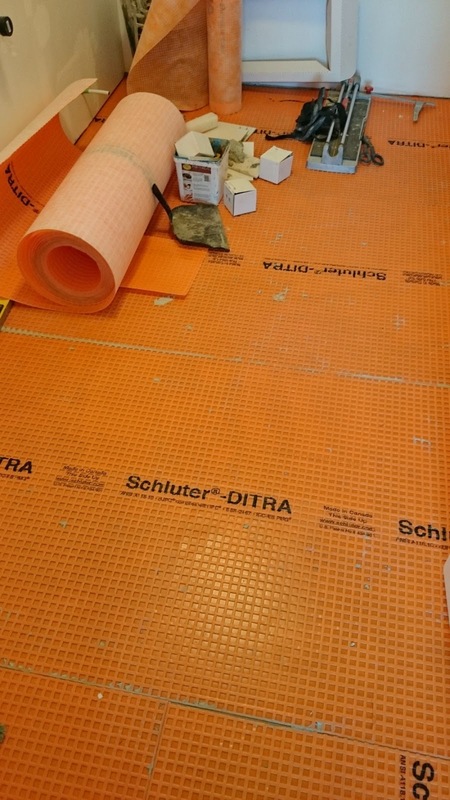 They used Schluter Kerdi board in big sheets (I guess to avoid seams) so it might be all or nothing, but I've got process pictures so at least anyone who gives me an estimate has an idea of what's under there. Our floor tile was discontinued and that would be affected too. As well, the tub is sort of embedded in cement for stability, as per manufacturer's instructions. I'm also worried someone else will bugger it up more – these guys seemed like the best bet when I got estimates the first time. This is a small town, where everyone pretends to "play business". I will chat with my insurance company and see what they say. Thanks again!! It sounds like you've had a terrible time of it lately! I really hope that this jerky shop owner puts on his big-boy pants and takes responsibility for his mistakes. Courage! Haha, nope! He played the old, "wasn't us" card. Fun fun. I guess I need the Ghost Busters next because clearly a poltergeist is running around wreaking havoc in my bathroom, lol. Good luck getting the contractor to make this right. Unfortunately , lots of contractors are only in it to make a quick buck and move on to the next job. I am in a large city and wanted to have my bathroom remodeled. After vetting a number of local contractors using Angie's List , Houzz and other review sites I selected one with high ratings and who made me most comfortable in personal interviews. To make a long story short, they did only a so-so job and showed little respect for me or my home. Worse yet, their attitude was 'we did a good job, what's your problem? ' As a way to express my disappointment, it gave me some satisfaction to go to all those websites and rate the contractor poorly and explain just how they treat customers. That is so frustrating that you even did everything you could to hire the right person. You'd think that going through Angie's List and Houzz would weed out the duds! I'm so sorry to hear about your lousy experience – hopefully you've saved someone else the headache with your honest reviews. Better still, maybe they've stepped up their game! Hello, fellow Thunder Bay-er (what are we called as a collective?). So nice to hear from someone local!I was waiting to hear from the tiler who "has a guy who can repair it" but then communication broke off. He stopped replying to my emails. As it turns out, his tiling company is embroiled in another situation right now (jeesh), so I imagine he's busy. I haven't looked into repairing it myself – I'm nervous about making it worse. I will be going ahead and taking him to court because there are a litany of other problems and at this pace, we will never reach a resolution between the two of us. I am nervous about the legal ramifications of naming him here – I would like to settle the matter in court, and then at that time I am not above naming his company if it is legal for me to do so. I wanted to give him the benefit of the doubt, but so far I'm not impressed. I completely understand your concern and I would hate for someone else to hire him and experience this level of dissatisfaction. But once I name him, I'm fairly certain my review will show up before his website in a Google search, which will be terrible for him. What happened to the tub saga. I just chipped my tub while I was trying to install it. I'm so mad I want to cry. Did you fix the tub? If so, how?? We still haven't fixed it. Talking with the company that damaged it went no where and there's just been too much going on to have the time/money to follow up with a lawyer/courts although it may come to that. Honestly I just try my best to ignore it. I would recommend finding a professional tub refinishing company to give you an estimate and ask for photos of their past work. Sorry to hear about your damage, I know that angry/sad feeling so well. Hi, can you share the details of the floor tile? 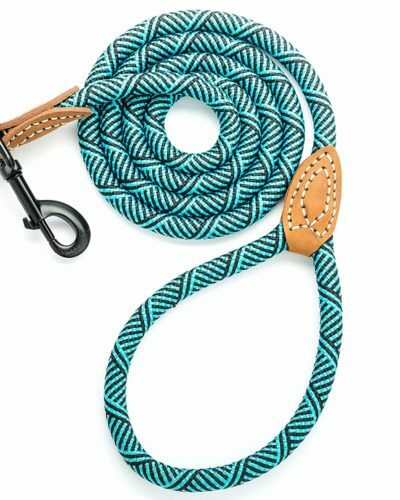 Brand, color, source, etc.? Love it! Of course! I have all of the sources – along with more photos of the finished space – in this post: https://www.danslelakehouse.com/2016/08/a-mid-century-modern-inspired-bathroom.html (just scroll to the bottom).